You'll be £11.99 closer to your next £10.00 credit when you purchase Warships After Washington. What's this? The Washington Treaty of 1922, designed to head off a potentially dangerous arms race between the major naval powers, agreed to legally binding limits on the numbers and sizes of the principal warship types. In doing so, it introduced a new constraint into naval architecture and sponsored many ingenious attempts to maximise the power of ships built within those restrictions. It effectively banned the construction of new battleships for a decade, but threw greater emphasis on large cruisers. This much is broadly understood by anyone with an interest in warships, but both the wider context of the treaty and the detail ramifications of its provisions are little understood. The approach of this book is novel in combining coverage of the political and strategic background of the treaty – and the subsequent London Treaty of 1930 – with analysis of exactly how the navies of Britain, the USA, Japan, France and Italy responded, in terms of the types of warships they built and the precise characteristics of those designs. This was not just a matter of capital ships and cruisers, but also influenced the development of super-destroyers and large submarines. Now for the first time warship enthusiasts and historians can understand fully the rationale behind much of inter-war naval procurement. The Washington Treaty was a watershed, and this book provides an important insight into its full significance. The Washington Treaty attempted much but delivered poorly. However, it introduced some very creative ways of designing and building warships to maximise permitted tonnage. The author has produced a comprehensive review of the Washington Treaty's impact on naval fleet development between the two World Wars. Most highly recommended. This is an excellent book that gives us a real insight into the thinking within the five major world navies during the 1920s, and the reasoning that led to the various classes of warships constructed during the period, and that in many cases went on to play a major role in the Second World War. ... As the editor of Warships annual, it is no surprise that this is an invaluable and authoritative reference work of warship development between the wars. Overall, this is an extremely well-written and interesting account of an aspect of the Treaty that has, until now, been less well-explored than the treaty itself. A number of other reviewers have also commented favourably, so it should be a ‘must’ for any reader of naval works. I recommend this book not only for its detail. More fundamentally, I recommend it for linking the development of marine technologies to world events. The volume provides an examination of the navies in the immediate post-World War 1 period, and analysis of the treaty itself, its general impact and the effect specifically on new capital ships, carriers and cruisers. The author tried hard to put the treaties into their historical context to bridge the gap between more general international historians and specialist naval writers. The author writes well and puts over the technical detail clearly and accurately. The intricacies of naval treaty diplomacy are nevertheless dealt with most effectively and clearly and the book should be required reading for anyone who wishes to understand this period of naval history. The approach of this book combines coverage of the political and strategic background of the treaty, and the subsequent London Treaty if 1930, with analysis of how the navies of Britain, the USA, Japan, France and Italy responded, in terms of the types of warships they built and the precise characteristics of those designs. This was not just a matter of capital ships and cruisers, but also influenced the development of super destroyers and large submarines. For the first time, warship enthusiasts and historians can understand the rationale behind much of inter-war naval procurement. 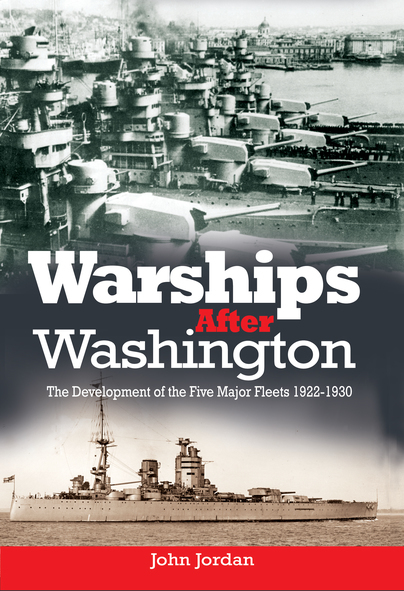 The Washington Treaty was a watershed, and this book provides an insight into its full significance, looking at how capital shops and aircraft carriers were developed prior to 1930. … deeply satisfying encyclopaedic book that compares the development of British, French, Italian, Japanese and US navies after the Washington naval treaty of 1922. ‘Warships after Washington’ benefits from some international research and is well-written, with carefully chosen illustrations , and useful tables. Whether new to the subject, or already well-versed in interwar naval history, this book merits a place on the serious naval student’s shelf.